In the metal recycling industry, discarded radioactive materials can seriously contaminate a shredder, baler, steel melt or bag house, resulting in significant clean-up costs and lost productivity. 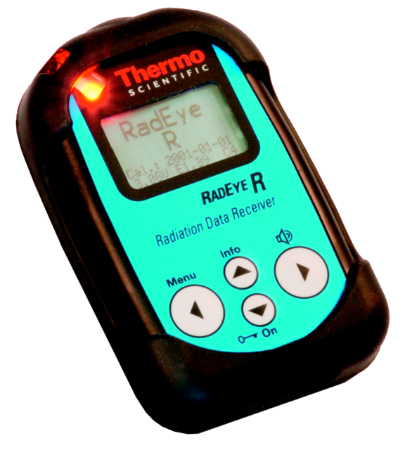 The Thermo Scientific™ RadEye™ GR Grapple Monitoring System is a wireless radiation detection system designed to be installed on a grapple to monitor scrap metal while it is still in the scrap pile under the grapple. Even when radiation is highly attenuated, the RadEye GR system responds to shielded radioactive sources to stop them from making their way into the steel making process. The RadEye GR Grapple Monitoring System is a radiation detection device designed and proven through extensive testing for the extreme forces and harsh conditions experienced when installed in a grapple. The RadEye GR system provides an additional, significant security increase to present portal monitoring because it is closer to the radioactive source and maintains contact for a longer period of time. Compact detector size - negligible load capacity reduction while providing high sensitivity. Enhanced sensitive for low gamma energies. Superior value: Small investment and low cost of ownership. Multiple portable RadEye GR display units possible. Simple and comprehensive data logging and reporting. Radiation test handled by single person. ViewPoint centralized real time monitoring option. Optimized shape and thickness of the detector dome allows even low energetic radiation to cause a significant signal in the detector. RadEye R Receiver Unit (option to increase the number of Receiver Units). Detector Unit (Installed on grapple). Battery Module and Radio Transceiver (Installed on grapple).